The complete DMT knife and tool sharpening kit for just about every edge—straight, concave, convex or serrated edges all rolled up in a convenient Cordura storage pouch. The Diafold® Kit includes (2) Double Sided Sharpeners (FWFC, FWEEE), Serrated Knife Sharpener (FSKF) and Flat File (FFC). All Diafold® models measure 9 1/2" long when open and 5" long when closed. The folding plastic handles protect the sharpening surfaces when not in use. FFC - The Diafold® Flat File will accommodate confined, narrow applications; only 1/16" thick. Coarse diamond grit on one side, tapers from the base 3/4" to 1/4". FSKF - The Diafold® Serrated Knife Sharpener not only maintains serrated edges, but also serves as a mini-steel, gut hook sharpener and conical file. Fine diamond grit. One tool for many tasks—an excellent value for home, shop and recreational use. Tapers from the base 1/4" to 1/16". FWFC - Dual purpose with compact convenience, the Double Sided Diafold® Sharpener offers two 4" x 1" Diamond Whetstone™ surfaces (fine and coarse) in one lightweight, portable sharpener. Sharpen blades, kitchen knives, specialty and garden tools, etc. FWEEE Double Sided Diafold® Sharpener one side extra-extra fine and the other extra-fine Diamond Whetstone™ surface. Perfect for tools requiring a razor-sharp edge for extremely precise performance: from fixed blades to fine kitchen knives, from craft and model tools to razors. Tan-Extra Extra Fine (3 micron / 8000 mesh) to provide the finest polished edge of all bonded diamond abrasives. 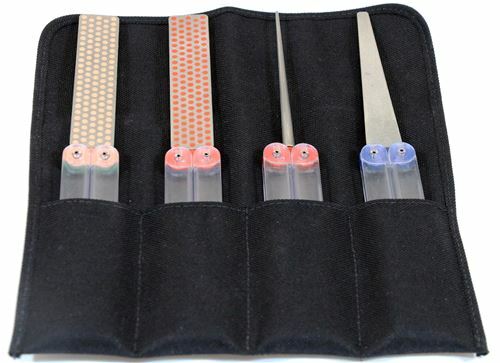 DMT sharpeners hone/sharpen in a fraction of the time required by conventional files/sharpeners. No messy oils needed -- use dry or with water. Durable construction will provide years of consistent performance and reliable service. Made in USA.